Generally within a year after marriage, a baby would be born to the young couple. There were no doctors or hospitals so the birth took place in the farm home and the delivery was supervised by a moasa (midwife). Occasionally the birth would be a real trau¬matic experience and some mothers died in child birth. Within three weeks or so the baby would be baptized and named, often right at the church following the regular service. A basin of water would be placed on the table in front of the altar and the sponsors would take turns in holding the baby while the priest and the cantor chanted the appropriate prayers. The climax would be reached when the priest would lift the naked child from his swaddling clothes and dip him in the water. Some priests would pinch the child’s nostrils and if there was sufficient water would hold the child’s face down, completely immersed. None drowned. Nearly all children cried loudly, not knowing what was taking place. Once dried, and dressed, the little darling would quieten down especially if there was a soother handy. During the pioneer days, most of the children were named after close relatives, generally the grandparents and then favorite uncles and aunts. At one time in the Boian area, there were six George Tomas. Evidently George was a favorite name but what confusion it would cause. None of the children had second names. Every child inevitably used the initial of the father’s Christian name. So we had George J. Toma, George D. Toma, George W. Toma and so on. The writer’s grand¬mother was Sanda (Alexandra) Toma and she lived to see five granddaughters named after her. The next generation chose other names for their offsprings. The long Orthodox church service had finally ended this October Sunday. The priest had finished his message and was now making his announcements of forthcoming events. Suddenly everyone, including the older women at the back of the church, who had been busy exchanging bits of gossip, began listening attentively. “From today in three weeks”, announced the priest, “the marriage ceremony of Sanda, daughter of Mr. and Mrs. T. Ionescu* and Nicolai, son of Mr. and Mrs. V. Balta* will be performed in this church follow­ing the service. If for any reason anyone feels that this marriage should be prevented, please let me know prior to that day. The banns will be proclaimed two more times”. With these words the priest snapped shut his notebook and took his place between the two icons in front of the altar, holding a small cross in his hands, ready to bless each person that passed him on the way to receive the offering of holy bread. Sanda and Nicolai had known each other since childhood. They had attended the same school, although Nicolai was six years older. Their parents had known each other in the old land. 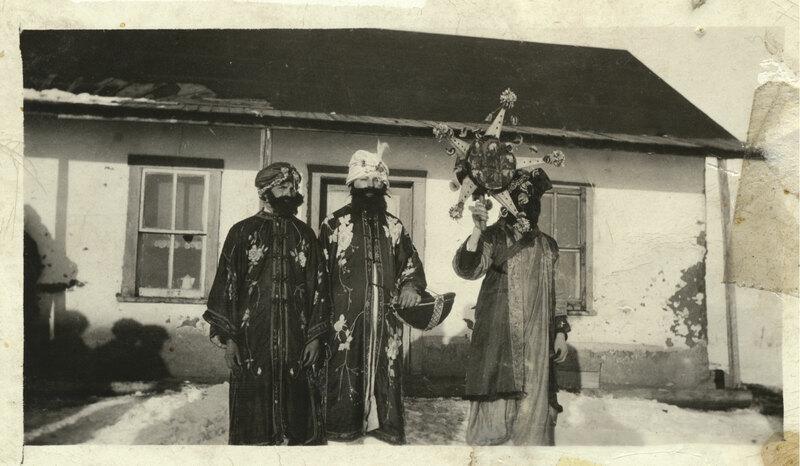 The traditional customs had been followed closely. Nicolai with a “staruste” (matchmaker) had visited Sanda’s home and Sanda had consented to the marriage. She had barely passed her sixteenth birthday, but she saw no other occupation other than marrying and living on a farm, like her mother and her grandmother had done before her. Besides there were eight younger brothers and sisters. The wedding day had arrived and at Sanda’s home there was great excitement as everyone was preparing for the celebration. The young bride, looking radiant in her Romanian wedding dress, was in the third room of the fairly large house, looking quite happy. She wore the traditional embroidered blouse with an attached underskirt. Over this she wore a sucna (jumper) made of a rich velvet material, wine in color. The skirt was further embellished by ribbons sewn horizontally on the lower part of this garment. Around her neck she had a beaded neck piece, given to her by her grandmother, and two strands of red beads. On her feet she wore white stockings and white shoes. She looked remarkably lovely and very innocent. The bride’s parents were busy welcoming guests and relatives who had already arrived to help and par­ticipate in the bride’s send-off to church. The members of the orchestra were seated to one side, each one holding his instrument – a violin, a dulcimer and a flute. The table was set for a light meal. In the center was a large “colac” (a braided bread) and on it lay the bridal wreath made of peacock feathers, decorated with colorful ribbons. The groomsmen hastened to seat everyone while they themselves sat at the ends of the long table ready to assist in the proceedings. side of her. The parents reached forward and picked up the bridal wreath and placed it on their daughter’s head. Her maids adjusted it quickly, making certain that it rested securely. The bride who had tasted no food, appeared slightly nervous but still radiant. She and the groom had gone to church Saturday evening and had confessed. Since they were to receive holy communion before the ceremony, they were warned not to eat any solid food. Sa scoatem dansul din casa. Sa ramae binili Sa traiesca tineri”! For the outside we are bound. May the good be left behind May the young a long life find”. etc. Led by the “vatajel” (groomsman), the guests still singing, proceeded to the outdoors. As they left the house the bride’s aunts threw rice after the bride, a symbol of good luck. The wedding party left shortly for the church in the few cars that could be mustered for the occasion. Others left by wagon or democrat. “On a piece of ploughed land Walks a man seeding by hand With his mouth these words he utters.” etc. The participants ended outside and they left for church. The bride’s group entered first. All eyes turned towards the entrance and even the members of the choir upstairs began stretching their necks in order to catch a glimpse of the young bride. The priest contin­ued chanting the prayers. After venerating the icons, the bride and her attendants moved to the north side of the church and listened to the service. Shortly after the groom arrived, tall, dark and strik­ingly handsome. He and his attendants venerated the icons and took their place at the south side of the room. He clasped his hands in front, glanced briefly at the bride, then drew his breath in sharply. She looked prettier than ever. The service droned on. At 12:30 P.M. the service was over and prepara­tions were made for the ceremony. A small table was placed in front of the altar. This was covered with an embroidered cloth on which were placed items nec­essary – the crowns, the jar of honey, the colac and the rings. On the floor before the table the “nana§a” put a Romanian tapestry and on it a pure white hank- erchief was spread out. At the four corners of the hanky four quarters were placed for good fortune. The couple approached the table and each one placed one foot on the hankerchief, the bride her right, the groom his left. Directly behind the bride stood her matron of honor (nana§a) holding a lit candle deco­rated with a pink ribbon and a flower. Behind the groom stood his nana§ (sponsor) also with a lit candle embellished with a blue ribbon and a blue flower. Everyone was now ready. 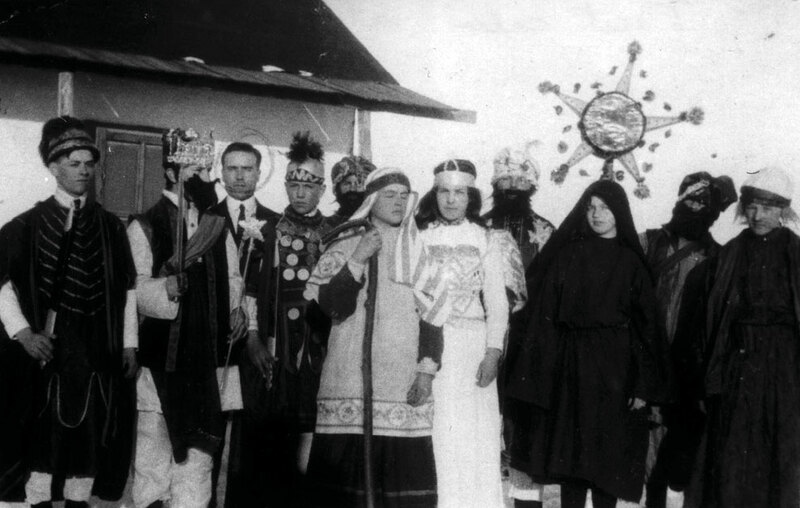 The Romanian Orthodox marriage ceremony is long and rich in symbolism and ritual. The lit candles (symbols of purity), the rings (symbols of endless love and union), the joining of the right hands (which signify that the bride and groom become one) – all these add much to the ceremony. The most exciting moment is the crowning of the groom and bride. The crowns represent the honor and reward placed on them for the purity of their lives. The drinking of wine from the same cup symbolizes the sharing of joys and sorrows. Finally the procession around the table led by the priest signifies that the marriage has no end and likens Christian living to an orbit around the gospel. Triple circling commemorates the Holy Trinity. The next part of the ceremony was the removal of the crowns. The priest and the nana§ each placed one hand on the crown and the former chanted, “Bride­groom, may you be exalted like Abraham, blessed like Isaac, fruitful like Jacob, yet obeying the command­ments of God”. The crown was then removed and placed on the table. Likewise the nana§a and the priest each laid a hand on the bride’s crown. Again the priest intoned, “Bride, may you be exalted like Sarah, rejoice like Rebecca and be fruitful like Rachel, also obeying God’s laws”. The crown was laid on the table. A few more prayers with responses of “Doamne milue§te” (Lord have mercy) and the ceremony was over. The whole congregation led by the choir sang “Multi ani”! (Many years!). The wedding party left the church slowly, and as they descended the steps, pictures were taken by the one person who was fortunate to have a box camera. The bride and her group left first and returned to her parents’ home where a huge meal was served. The afternoon was spent dancing, singing and visiting. The groom, with his attendants, returned to his home where similar festivities were enjoyed by all. At about 4:00 P.M. preparations were hastily made by the groom’s usher to leave for the bride’s place and “buy” the bride. Once there, they were invited in. Sanda was behind the table with her bridesmaids. The groom’s usher with the help of the bride’s younger brother proceeded to “buy” the bride. The young lad held two slender willow wands over which was draped a white silk shawl with long fringes. Appro­priate verses were exchanged between the groomsmen and the bridesmaids ending with coins being tossed to the latter. The shawl was then placed on the bride’s head over her wreath and adjusted to stay in place. Sanda will henceforth wear her hair in a bun on top of her head and over this she will wear a white shawl. At this point the guests sang the bride’s farewell song. It told the bride not to grieve for her parents, siblings, nor the garden with its lovely flowers as she really is not going so far away. More toasts followed and more shouts were heard of “Vivat! Vivat! Sa traiesca mireasa! Sa traiesca tineri!” (Long live the bride! Long live the young couple!). The groom who now joined his bride prepared to leave. Hands were joined and the group began singing once again. Sanda tried to look happy as she bade her parents farewell but tears blinded her eyes. Her mother, too, was overcome as she gazed at her favorite daughter, so young, so lovely and so innocent, and prayed silently that her marriage be a happy one and that she not be burdened by too many children. Before the group left for the groom’s house, the bride’s trousseau had to be carried out. The grooms­men brought out the trousseau which consisted of a sizeable trunk filled with the bride’s clothes, table cloths, pillow cases and linens. In addition there were pillow’s and two wool-filled quilts. All these were brought out to the accompaniment of couplets sung by the attendants. made its noisy way. At the door of Nicolai’s home the couple was met by the parents. Nicolai’s father held a bottle and a glass in his hands for more toasts while his mother held a colac and a glass half-filled with salt -basic necessities of life. Toasts were exchanged and the mother-in-law took the bride’s hand and let the group inside the house where they were seated once more at the head table. More food and drinks were served. How could they eat so much! Later in the evening the head cook and three of her helpers put on a performance. They danced into the room (more of a shuffle than a dance) chanting humorous verses all the while about the important guests. Each woman carried a platter with a well roasted stuffed chicken decorated with grapes and slices of apple. Each chicken was meant for one of the participants behind the table such as the groom or the sponsor. The cook wanted to show her culinary skill. Humorous verses were exchanged, as the women swayed their bodies rhythmically and tempted the seated guests with the loaded platters. Eventually money was offered to the cooks and the delicious food was laid on the table. The tired bride looked up and smiled graciously. The cooks enriched by the proffered money, joined hands and made a circle of their own. The orchestra struck up a “hora” and these jolly women performed a circle dance of their own all the time interjecting humorous couplets. When this was all over, the groomsmen took up the donations to the young couple and following this there was dancing and singing late into the night. 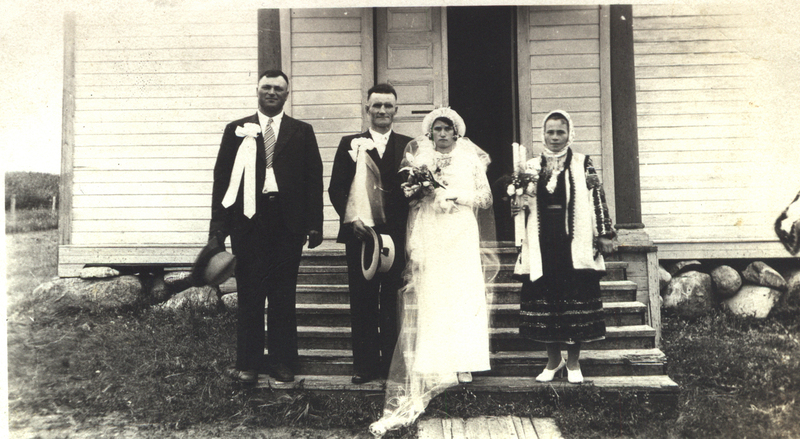 In the early pioneer days the Romanian weddings generally lasted three days. The marriages always took place in a church on Sundays and despite some unhappy ones, they lasted through life. The recep­tions were held in the homes of the young couple as described above and there was a definite ritual to be followed. The “vatajel” (groomsman) was in charge and he saw to it that the traditional steps were fol­lowed closely. In the mid-twenties the brides began wearing the white dress and veil in place of the Romanian attire. Slowly some of the other customs were dropped. In the forties, weddings began to be held at the community hall as a joint venture by the parties concerted. This made it more economical and less tiring for the women. Today, besides the usual good food that is served, the only custom that is still retained is the custom of donating money and/or gifts to the newly married. Only a few of the older people know the traditional wedding songs. Near St. Mary’s Church at Boian, there is a belfry which holds a huge church bell. The original bell has been replaced but it was said that on clear, quiet days, when the church bell rang, it could be heard within a seven-mile radius. The bell tolled to call the faithful to worship, at certain times during a church service but also to let the people in the area know that one of their own had been called to the Lord. Should the bell be rung during the week, the first thought that came to the listener’s mind was “Cine a murit”? (Who died?). The priest and the cantor would be the first to know, as well as Ion T. Toma’s family, as nearly always one of the boys would be ringing the bell. Even though there was only one phone in the district the news spread via the grapevine and within a day or so the whole community would know. Maria had kidney problems for some time but she continued working and caring for her eight children. She kept hoping that another day or in another week she would improve. The opposite happened. Her con­dition worsened till one day she was so ill that her oldest son took her to the nearest hospital. Within two weeks Maria died. The bell began tolling the sad news on a Wednes­day evening. The immediate relatives were notified and in time everyone knew. The women began arriv­ing immediately at the home of the deceased. The body was brought home and since there was no funeral home nearby a few of the older women pre­pared the body. They bathed the corpse and then dressed it in the usual colorful Romanian costume – Maria wore her bridal costume – the same blouse, same underskirt and jumper, the shawl on her head, but different shoes. The men made a wooden coffin out of some pine boards and the body was placed in it. It was then put on a wide bench in the “casa cei mare” (the third room of the house). There it would lie for three days. A candle burned nearby and as the news travelled, friends and relatives would arrive to pay their respects to the departed. It was customary to offer food to guests so the women were constantly occupied in the kitchen. Everyone was so kind and helpful and many moved about quietly saying nothing but kind words about the deceased woman. The evening prior to the funeral the priest and can­tor arrived and the prayer service was held right in the room where the deceased lay. After the service a light lunch was served to all who attended. Then all would leave except some of the closest relatives and friends who stayed all night, observing the wake for the dead. The day of the funeral arrived. The priest, cantor and pallbearers came early. They had brought two banners from the church to use in the procession. The prayers began at ten o’clock and when completed, the pallbearers proceeded to take the coffin out. As they crossed the threshold they raised and lowered the body three times. This symbolized Maria’s farewell to the home she loved so well. While this went on two older women were wailing close to the body causing the children to cry too as well as other soft-hearted folk. Outside the house, the coffin was placed on some supports and the husband invited all to the “praznic” (memorial dinner). The tables had been set quickly and efficiently by the many women who volunteered to help, feeling that they could at least do some small favour for the deceased. There was a large crowd so this meant three settings would have to be made. This was done rapidly enough under the supervision of Domnica, the head cook who seemed to have boundless energy. When everyone finished the procession set out for the church. It was a sunny day and the hearse was drawn by two white horses who seemed to sense that it was a sad, dignified occasion. They responded knowingly to their master’s every command. Many of the people walked. At the farm gate the procession halted and prayers were said. When this was finished one of the older children handed a pomana (braided bread, apple and a candle) to one of the bystanders. This would be repeated at least six times, ending in front of the church. 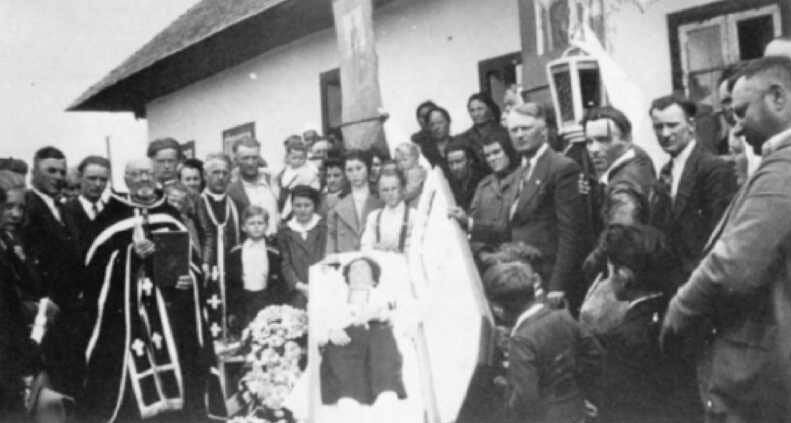 Once the body was inside the church, the long funeral service started. Candles were lit in memory of the dead. After the eulogy was given, the crowd filed past the open casket paying their final respects. More tears, blowing of noses and sobbing! The unfortunate hus­band and father moved slowly, numb from so much sorrow and so many problems. Even the most hard­ened of the spectators could not hold back their tears when the children, especially the little ones, were lifted up to kiss their mother farewell. The casket was closed and the procession moved out. Again the wailers started and continued till the open grave was reached. More prayers by the grave ending with “Vesnica ei pomenire” (memory eternal), sung by all and the body was lowered. Some of the older people threw a few coins into the open grave. Then grave diggers began shovelling dirt into the hole. At this point the youngest child looked back and asked “Why are they doing that Bunica”? His grandmother clasped him in her arms and began sobbing uncontrollably. Others crowded near the family trying to comfort them. Slowly the crowd began dispersing, many of them whispering almost inaudibly, “Dumnezeu s-o ierte”! (May the Lord forgive her!) The family left last return­ing slowly to a motherless home, but time heals all wounds, physical or emotional. In the early days, January 7, Christmas morning, most families went to church by horse-drawn sleighs. The women wore their traditional clothes including their fine sheep skin coats. The jingle of sleigh bells was heard from near and far as team after team pulled up the steep hill leading to St. Mary’s Romanian Church. By eleven o’clock the church would be packed with young and old. At the end of the service after the Christmas message was delivered the whole congregation would burst out singing the old favorites, “Trei Crai,” “Dimineaja lui Craciun,” and “In Orasul Vifleem”. There were no books of song sheets because the older folks, particularly the mothers knew these songs from memory. Once the service finished everyone left eager to partake in the Christmas dinner, now that the lenten season was over. Early in the afternoon young boys who had previously organized themselves into small groups started their carolling. Often if the weather was mild, they would carry a star (steaua). They walked or else road in a cutter drawn by one horse. The carollers would continue as long as their energy and voices held out. At each home they were welcomed and were paid five cents per person by the host or hostess. 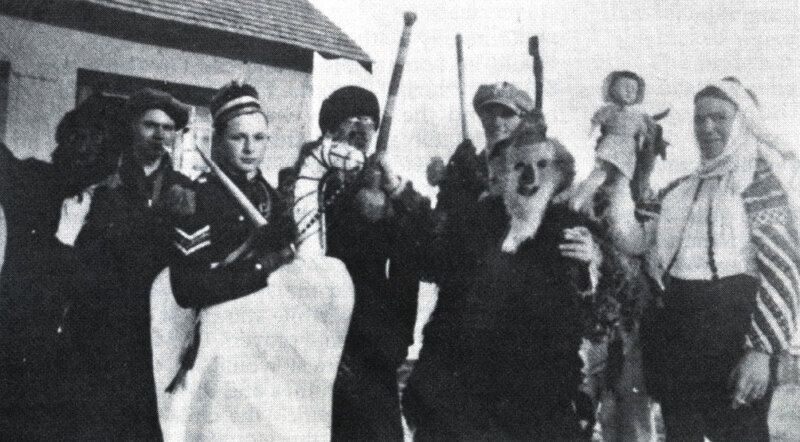 Prior to the author’s carolling days, the host would reward the carollers with a colac (bread twist). The writer remembers when he was twelve years old he earned $3.50 at Christmas and on New Year’s eve. With this money he purchased a sled from T. Eaton’s catalogue. What a thrill it was to go sledding down the hills by the school, if you didn’t meet a horse-drawn sleigh coming up the hill towards you! For a few weeks he was the most popular boy in the school because everyone wanted to try a bought sled. One group of older boys would act the play, “Irodul” (King Herod). These were generally young men with good singing voices. It was a solemn serious play and everyone waited anxiously for the arrival of these actors. Another group would dance the “Calu” (the horse). In contrast to the King Herod play, this performance was humorous and boisterous. The man dancing the horse was graceful and light on his feet, keeping time to the music provided by the violinist and his partner who played the dulcimer. The “old man” with his sheepskin coat turned inside out covering a hugh hump on his back and carrying a cudgel in his right hand led the dance in a large circle constantly dancing backwards, followed by the prancing horse. The “baba” (old lady) dressed in a typical Romanian older woman’s costume carried a doll cradled in one arm and in her free hand carried a broom, symbols of motherhood and household duties. She followed the “horse” closely, shuffling her tired feet but keeping time to the music. To add to the merriment there was a gypsy who was out to tell everyone’s fortune for a price; a pedlar and a woodsman each one trying to outdo one another. In the late forties the young men of the time Canadianized this performance by including an “Indian” as a member of the troupe. The high point of this spectacle was reached when the mosneag (old man) danced a Romaneasca with the farmer’s wife or daughter – whichever was more buxom. Likewise the farmer would dance with the baba. In charge was the constable who was also the treasurer. He saw to it that the various dances were of proper length and that the performers did not outdo themselves in one place as there were many homes to be visited. When he called out “forverds” the dance ended and all too soon the entertainers left, much to the sorrow of the children in the house. Since most of the entertainers wore masks, the host and his guests spent some time guessing who played what part. Everyone enjoyed the “calu”. The money collected by these groups was turned into the community fund. Part of it was used to hire an orchestra and the whole community enjoyed a free dance usually in the afternoon of January 8. One New Year’s Eve January 13, on the Julian Calendar the “calu” performance was repeated if there were enough willing to participate. 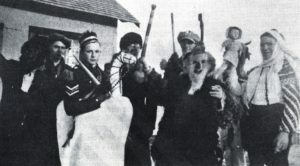 The young lads visited the homes this round with the plugusorul (the plough). While one boy kept swinging a bell, another recited a long poem in which the narrator described the ploughing of the land, seeding of the grain, ending with the baking of the bread. Since they were an agrarian people, this was understandable. To complete the New Year’s Day activities early in the morning these same boys would come with their pockets full of grain and would scatter it in the homes while reciting verses wishing long life and a fruitful harvest in the coming year. With “the blessing of the water” on January 19, the Christmas holidays ended and the community settled down to the regular winter activities. The Orthodox Easter is observed on the first Sun­day after the first full moon after the first day of spring. That is why it varies from year to year. Keep­ing in mind that the first day of spring is March 21, it is easy to set the date for Easter. One other condition must be met. It cannot precede the Jewish passover. At Boian, Easter too, was an important day but the whole occasion was and still is a solemn dignified observance terminating on Sunday morning with the resurrection service and the blessing of the pasca (Easter bread). The Easter service started at midnight, Saturday night with the priest chanting the prayers, the choir responding. While this went on, the young men of the district built a huge bonfire at a respectable distance from the church and kept it burning all night. The men and boys chatted, exchanged jokes and took turns hauling firewood from the nearby bushes. Those who were tired standing in the church would come out and others would go in. Early in the morning the priest and the members of the congregation would come out and the women would make a large circle in front of the church placing their pascas on the ground before them. The priest, cantor and a few choir members were inside the circle for the special prayers before the blessing. This was followed by the blessing itself which consisted of sprinkling of holy water by the priest. At this time the whole congregation would sing, “Hristos a inviat!” (Christ is risen). When completed everyone went home to have a short nap before the joyous Easter dinner which was always eagerly anticipated after six weeks of lent.